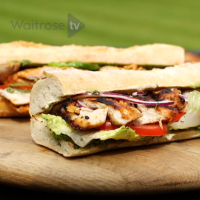 I first came across a tandoori chicken sandwich 20 years ago in a hotel in India and it opened my mind to the humble sandwich, then largely a vehicle used to empty the fridge of cold bits. It was made with love… and it showed. This recipe is based on those memories. You can cheat and buy a tikka paste if you’re short on time or scale the recipe up to cook a whole bird at home and this chicken will solve a multitude of lunch and lunch box quandaries. 1. Pierce the chicken all over with a fork. Put the chicken in a shallow dish with the marinade ingredients, together with some seasoning, cover and marinate for 20 minutes in the fridge. This will help to tenderise the meat. 2. Remove the chicken from the marinade and put in a dish. Put the marinade, together with the tandoori paste ingredients, into a blender and whizz until smooth. Pour over the chicken to coat, cover, place in the fridge and marinate again for as long as you can; at least for one hour and up to overnight. 3. Remove the chicken from the fridge up to thirty minutes before cooking. When ready to cook, preheat the oven to 200°C/gas mark 6. Place on a rack with a baking tray or some foil underneath and bake for 10 minutes. Take the chicken out of the oven and finish off on the barbecue or griddle pan for 2-3 minutes each side. Meat should be cooked through and the juices should run clear. 4. Place the baguette or slices of bread in the oven to warm up a little for a few minutes. Cut or tear the chicken into large pieces. 5. Butter the bread, layer on the lettuce, red onion and chutney then top with the chicken.